One caught my eye this week – “20 Unique Ways The Amish Raise Their Kids (That No One Else Does)” on a site called “Baby Gaga”, which looks like a mom or mom-to-be resource. Now that’s a pretty strong claim in the title – both the “unique” part and the “no one else does” claim. Curiosity got the better of me so I had a look. Below are the 20 points, along with my comments on each. Which of these are actually unique? Are they accurate? 20. WHEN AMISH CHILDREN GROW UP AND MARRY, THEY WRITE LETTERS TO THEIR PARENTS – I don’t know that writing letters to parents is something to emphasize above just letter-writing in general. But it’s true that Amish are more likely to write letters than your average American (the circle letter tradition comes to mind) – though that doesn’t mean that all Amish are prolific letter-writers. Some people prefer the phone, and nowadays with the pervasiveness of technology and changing Amish occupations, some even email (though I wouldn’t call that common either). This one seemed an odd one to start with as this is really about adult behavior – after all we are all someone’s “child”, even when grown-up. 19. THE AMISH BELIEVE THAT KIDS CAN BE “TRAINED” SO THEY NEVER MISBEHAVE – Yikes, this is not getting off to a great start. Amish parents know that children will misbehave and humans are imperfect for that matter and prone to sin. It seems a bit absurd on its face that misbehavior can be simply trained out of children. Amish children are comparatively well-behaved on the whole, and maybe that is what gives people this idea. 18. 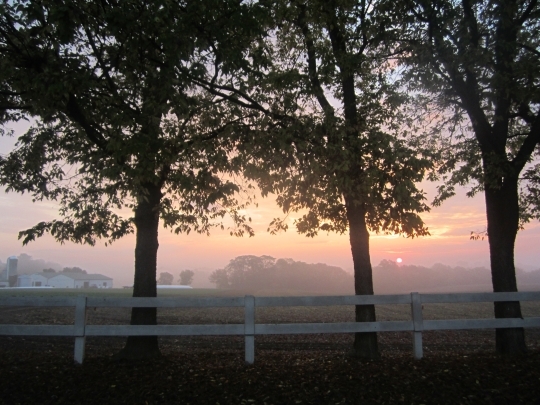 THE FAMILY WAKES UP SUPER EARLY (EVEN 3 A.M.) – Super early wake-ups are common on Amish farms. Cows must be milked. 4 or 4:30 AM seems to be a more common milking time from what I’ve seen, but this one checks out. 17. INSTEAD OF KIDS DOING CHORES ALONE, EVERYONE DOES THEM TOGETHER – True that chores and jobs are often done in groups, and even with smaller children, who might tag along even if they’re not old enough to really help that much. It doesn’t mean all chores are done together though. 16. THE ENTIRE FAMILY IS INVOLVED IN FARM LIFE, NO MATTER WHAT AGE – This relates to #17 above. Small farming is more a way of life than an occupation and it encompasses the entire family. You live on a farm and that makes you involved in farm life. Not exactly unique to the Amish, though small farming is something that has mostly dwindled outside of the Amish (and in some settlements, even within the Amish). 15. THE AMISH DON’T LIKE TECHNOLOGY (SO NO SCREEN TIME HERE) – The Amish don’t like or dislike technology as a whole, they just deem some things suitable and others not. They use it selectively. Amish teens often have smartphones, as do some Amish adults. 14. FAMILIES EAT MEALS WITH THE LARGER COMMUNITY ONCE A WEEK – This one is let’s say 50% correct. The Amish do have a fellowship meal after church service. It’s with the individual church, not necessarily the full community. And it’s not once per week, but every other week on the traditional Amish church schedule. 13. KIDS ARE RAISED TO CONSIDER FAMILY MORE IMPORTANT THAN ANYTHING ELSE – Hmmm…family is certainly important but God and being a good Christian would come in above even family. 12. FAMILY BREAKFAST IS A BIG DEAL – I’d agree breakfast together with family is important to the Amish. This will be accompanied by prayer and in some cases Bible reading or devotions, and singing. This is my favorite Amish breakfast item, if anyone was wondering (#2 on the list). 11. AMISH PARENTS BRING KIDS WITH THEM TO VOLUNTEER – Amish are involved in volunteering to various degrees. Helping another member of the community at a work frolic might be considered “volunteering”, but in terms of more traditional charity and mission work, some Amish do that as well, for instance via CAM (Christian Aid Ministries). I had a chance to participate in a CAM meatpacking operation once where around 100 Amish people canned and packaged beef and turkey for charity. Amish parents bring their children along to join in most things, so this one is not unusual. 10. 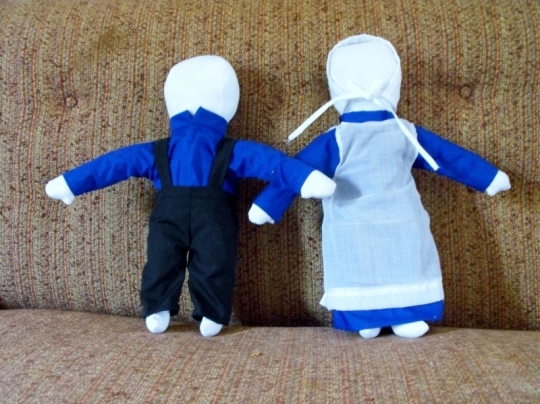 KIDS HAVE DOLLS THAT DON’T HAVE FACES ON THEM – The traditional Amish doll does not have a face on it. See our post on Kathy the Amish doll-maker for some examples. 9. 16-YEAR-OLDS ARE ENCOURAGED TO GO TO A BIG PARTY AND HAVE FUN – Rumspringa mythology will not die. It’s just too delicious a concept for outsiders that Amish parents might encourage wild partying by their youth. Some Amish youth do party and live a wilder lifestyle in their adolescent years, but it’s not something that parents or the community encourage. Quite the opposite, as it often creates a lot of concern (as with any parents of teens). 8. THE AMISH DON’T VALUE BUYING LOTS OF THINGS – Amish on the whole I’d say are less consumption-focused than the average American, but it doesn’t mean the Amish don’t like things. They might just like different types of things, like a hunting bow or a new horse. The thing is that a lot of the things they like can be seen as less frivolous and having a practical value. But it’s true that the typical Amish house is not cluttered with a lot of junk and forgotten impulse purchases. 7. PARENTS MAKE SURE CHILDREN CAN COOK – Well, girls especially, though if a family ends up having a lot of boys before any girls come along, those boys are going to learn to help out mom in the kitchen too. 6. WHEN KIDS START DATING, THEY HAVE TO FOLLOW A SPECIFIC TRADITION – The Amish do have a manner of dating that is typically based around meeting someone via a youth group. The standard date is for a boy to offer a girl a ride home. This is not the only type of dating however. One of my friends took his future wife to a country music concert. The point in this article talks about bundling (bed courtship), however, which is a tradition followed mainly by plainer Amish groups and disapproved of by a lot of Amish. 5. PARENTS WANT KIDS TO BE JOYFUL BUT ALWAYS PUT OTHERS FIRST – I can’t really find much issue with this one. Being selfless is part of being a good Christian. 4. THE AMISH HAVE RELIGIOUS BELIEFS THEY SHARE WITH CHILDREN – Ditto here. This one seems quite obvious. 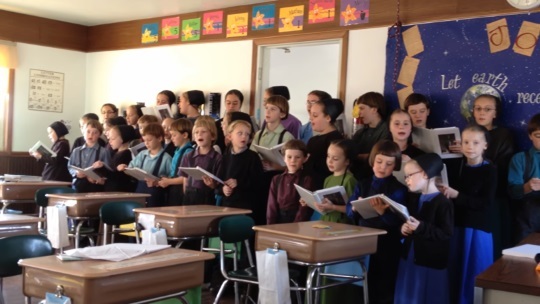 The Amish not only share these beliefs, they are absorbed by children just by being surrounded by other Amish people in their extended families, churches and communities. 3. 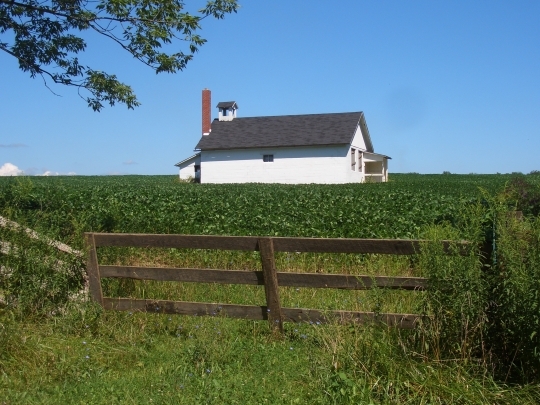 AMISH KIDS GO TO A SUPER SMALL SCHOOL – A one-(or two-)room schoolhouse would qualify as “super small” compared to modern schools for hundreds or even thousands of children. 2. HELPING OTHERS AND “HOSPITALITY” IS A BIG VALUE – This is an extension of #5 above. Doing unto others is important for Christians. 1. FAMILIES DO THINGS TOGETHER AFTER DINNER AND GO TO BED EARLIER THAN MOST FAMILIES DO – I would say this is pretty accurate too. 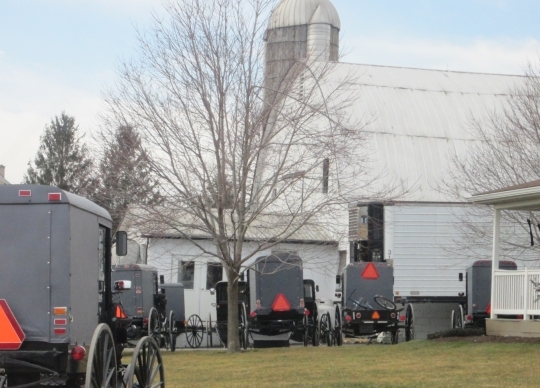 Without television and electronic gadgets and other distractions, or motor vehicles to make going far from home convenient, Amish life tends to revolve more around the home. Leisure time together is not uncommon. And going to bed earlier would be pretty common, as a lot of Amish occupations, not just farming, require early wake-ups (RV factory work, construction crews, and market stand owners to take a few examples). On the whole this article seems to be written about what someone imagines the Amish to be, or a more extreme and absolute version of who the Amish are in reality. Amish life is varied and while some things hold true more-or-less across the board – most beliefs and church practices – there are plainer and more progressive renditions of Amish life. And often exceptions to the “rule” can be found with a little investigation. While there are only one or two that I’d call “howlers” in the list above, quite a few of these start with a grain of truth and then a lot of the accuracy gets buried in generality or by trying to make too strong or absolute a statement. Nuance is needed when speaking about “the Amish”, though I realize that can be troublesome when speaking generally. Sometimes we have to omit it to have a productive discussion. I do it at times myself. I also think this article is really stretching the meaning of the word “unique”. Many if not all of these things are hardly unique, nor are the Amish the only people exclusively doing these. In fact I can’t think of one that might be exclusive to the Amish, especially when you consider other Anabaptist groups like Old Order Mennonites and Hutterites, or other religious communities for example. In any case I wouldn’t base my understanding of the Amish on the Baby Gaga article, but looking at it point-by-point it gave a good opportunity to clarify important aspects of Amish family and community life. 14 responses to 20 “Unique” Ways Amish Raise Their Children..? Most of the points above that are correct for most Amish would also apply in varying degrees with most Old Order and Ultra Conservative Mennonites. So, the statement that they are unique to “the Amish” is false. Thanks for this article… What a bunch of hogwash and overgeneralizations! I too get tired of these ‘click bait’ articles giving the ‘inside story’ on the Amish and their way of life. Neat to hear that Susan, what’s the link to your blog? Interesting that the picture is of Ontario Old Order Mennonites! Osiah do you mean one of the photos on the original article site I linked? Having visited a few Amish locales in the past several years, I agree that most Amish kids (at least up to “pre-teen”) are better behaved than most kids in this country, but having grown up in a heavily Catholic neighborhood, spending 12 years in Catholic schools, I could say that most of the Catholic kids in my neighborhood were better behaved than others…could it be at least partially due to Sister Mary Anna’s (the principal) bread paddle that she used to discipline kids with, in front of the 8th grade class? (This was in the mid 1960’s).Or that we were so scared of dying in mortal sin and going to Hades that we willingly toed the line? (I know I did!). Still, I think that spending more time with your kids, showing (and expecting from them) MORE RESPECT is crucial to them growing up to be kind, considerate, and even more obedient. I’ve seen the same with my granddaughters (in public school), when they’re paired up with a truly good teacher. (I volunteer at their school occasionally). You can tell when Mrs. So-and-So’s class is traversing the hall—it’s so quiet, they’re so well-behaved, it’s truly awesome! I went to Catholic school, but after the era of the paddle. Still, the nuns, one in particular, knew how to strike fear into this (at the time) 2nd-grader’s heart. Quite effective. I remember once I asked an Amishman about his kids. He made a joke about goats in reply. Would you please explain this? Because when I think of the Amish I guess that I have the pre conceived idea that they would not share the same bed until marriage. It’s actually an old, colonial-era tradition that carried over and stayed in some Amish groups. But again it’s a minority that do this. In theory they are supposed to lie fully clothed (there is also such a thing as a bundling board which could be placed between the couple, but I don’t know if Amish actually use this). In practice we know that is not always what happens. In some Amish groups, behaviors that you might not expect (also smoking and alcohol) are “the norm”. That is not something you will read a lot about or hear promoted by tourist boards, but it is the case. 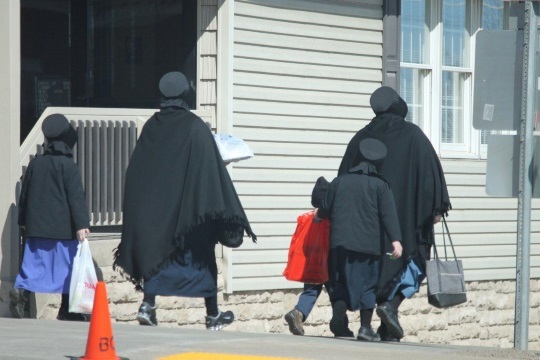 That doesn’t make it a typically Amish practice, but does emphasize how there are differences within Amish society, and even some things that cut hard against the generic image of the Amish. So what some people are saying is, Amish children and children who go to Catholic schools are much better behave than other children who go to public schools. I say rubbish to that, not all Amish children are well behave, nor are catholic children that well behaved. I would also ad, I am not Amish, nor did I go to a Catholic school, but my parents raise us to respect adults and others. Joan, Your parents’ encouragement for you to be respectful of others is above average behavior for many adults. Not all of us were brought up in caring, much less loving, homes, with parents that took the time to teach and mentor their children. Each of us takes whatever guidance was offered, and makes our own decisions concerning our behavior and attitudes in life. Be grateful your parents invested the time in your development. I hope you have the opportunity, if you choose, to do the same for your own children. Leave a reply to 20 “Unique” Ways Amish Raise Their Children..?